We’re happy to announce the latest release of the AppEngine WordPress plugin, version 1.6. We encourage all users of WordPress on App Engine to upgrade to this new version as soon as possible. This new versions includes the following bug fixes. Media uploads will no longer generate an HTTP error if editing the page for more than 10 minutes. Fix error with image sizes not being shown correctly when attaching images to a post. Please report any issues with the plugin in the support forum, or ask questions on stackoverflow where members of the team actively participate. We also gladly accept pull requests – you can find the plugin source on Github. This entry was posted in WordPress on February 24, 2015 by slangley. AppEngine WordPress plugin version 1.4 released. We’re happy to announce the latest release of the AppEngine WordPress plugin, version 1.4. We encourage all users of WordPress on App Engine to upgrade to this new version as soon as possible. This new versions includes a number of bug fixes, as well as a new feature for serving media files over HTTPs. The default HTTP fetch timeout is now 30 seconds, and fetch errors include a more descriptive message. The public URLs for uploaded media now work correctly in the development environment. The plugin now uses autoloading in the AppEngine SDK to improve load time performance. This version of the plugin includes a new feature, that makes it possible to serve uploaded media files over HTTPs or HTTP. To enable HTTPs serving of uploaded media, select the checkbox in the plugin settings page, as shown below. Once selected, all media files that are subsequently uploaded will be served over https. Note: Changing this setting has no affect on media files that have already been uploaded. This entry was posted in appengine, WordPress on March 3, 2014 by slangley. As we announced recently, the new version of our App Engine WordPress Plugin includes import support for WordPress export files, forked from the popular WordPress importer plugin. This plugin lets you take content that you’ve exported from another WordPress site, in the form of an .xml file, and import it into your App Engine WordPress site. This post walks through the process of doing such an import. It assumes that you already have a WordPress installation on App Engine— if not, see these instructions. If you will be doing an import of a large .xml file, see the section below on “What to Do if You Have a Large Import“. As described in that section, you should make a temporary configuration change to your app before you do the import, to ensure that it finishes successfully. This entry was posted in appengine, tutorial, WordPress on January 22, 2014 by amyu. 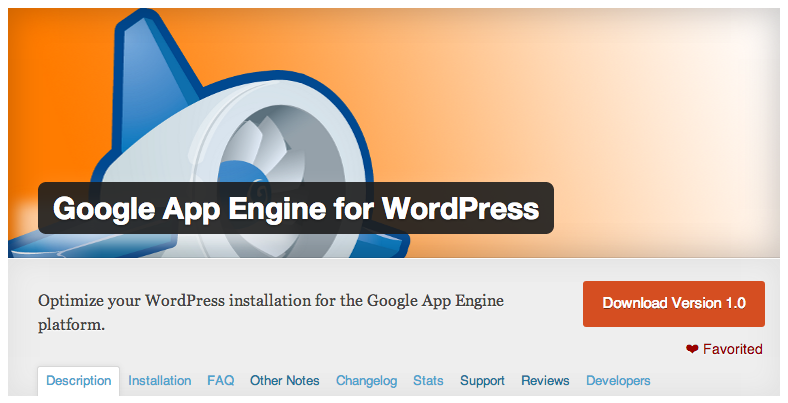 We’re happy to announce that we’ve just released version 1.3 of the AppEngine WordPress plugin. We encourage all users of WordPress on App Engine to upgrade to this new version as soon as possible. The new version of the plugin includes the following features and bug fixes. Import support for WordPress export files, forked from the popular WordPress importer plugin. URLFetch support for WordPress versions 3.7 and above, that fixes issues caused by core WordPress changes to the WT_HTTP Class. Bug fix for incorrectly detecting if a Google Cloud Storage bucket was writable by the application during setup. Better logging of plugin errors. Like always, please report any issues with the plugin in the support forum. This entry was posted in appengine, WordPress on January 15, 2014 by slangley. Removes the need for PIL to be installed in the local development environment. Removes the need for PyCrypto to be installed in the local development environment. Better checking if the application has write access to the Google Cloud Storage bucket for uploads. If you find any issues with the latest version of the plugin you can file them in the support forum. This entry was posted in appengine, php, WordPress on January 6, 2014 by slangley. Sitemaps are a valuable tool in helping search engines crawl your website. In this post I’ll show you how you can have a dynamically generated sitemap for a WordPress blog hosted on Google App Engine. Because of the read-only nature of the file system on App Engine, we’ll use Google Cloud Storage to store the generated sitemap file. We’ll also add some handlers to serve the sitemap, and to update it as part of a scheduled cron job. This entry was posted in appengine, php, tutorial, WordPress on January 6, 2014 by slangley. Frank Neulichedl just posted a nice tutorial on getting WordPress multisite working with the App Engine PHP runtime. The great new is it was really quite straight forward for Frank to get it up and working – jump over to his post for all of the details. This entry was posted in appengine, php, WordPress on July 9, 2013 by slangley. Caching is one of the simplest ways to improve the performance of your WordPress site. There are two simple, easy to use caching techniques that you can leverage when hosting a WordPress site on App Engine. App Engine has a zero configuration memcache service that can be used in conjunction with the memcached plugin, that reduces the number of database calls that are required to display a page. Batcache uses the memcache service to store and serve fully rendered pages. It has a number of tuning options that can be used to configure caching to not only reduce the time taken to serve pages, but the overall cost to run your site. Now edit your wp-config.php file and enable caching, and tune the batcache settings if you want. 'max_age' => 60 * 30,  // 30 minutes. Setting a large max_age value will dramatically reduce the database access of your application, at the price of clients potentially seeing stale pages. If you site has rarely changing content then this can be an effective way to reduce the overall cost of your application as it will reduce the usage of the CloudSQL database. Now all that’s left is to use appcfg.py to push your application to production, and your WordPress site will start using the memcache service.You can use the admin console memcache viewer to see how many objects have been cached, how often there is a cache hit and flush the cache if required. When serving static files, App Engine will automatically add caching headers so that the resources can be cached by the users browser and any intermediate proxies. By default, the cache expiration time is 10 minutes. However, you can set this expiration time to a higher value if you have resources that rarely, if ever change. The easiest way to do this is to set the default_expiration value in the app.yaml file of your WordPress site. Note: Be careful how you set the default expiration value. If you set a large expiration time like 365d then any changes to the content of the static resources will likely not be visible to users as the old content will still be cached in upstream proxies. Using both of these techniques can result in vastly improved page load times for your site, combined with a reduction in the CloudSQL usage and therefor cost. This entry was posted in appengine, php, WordPress on June 2, 2013 by slangley.